Of all the types of bread I have made, this is my favorite and the favorite of my kids. Tell me if this has ever happened to you. You buy bananas and find that your kids really love them. Then at the next grocery run you buy 2 or 3 bundles of bananas because you finally found something that the kids love. But only 1 or 2 bananas get eaten because they have moved on to strawberries or grapes now and bananas aren’t good enough anymore. So, you now have 15 bananas that are starting to get brown spots on them. I’m not the only one, right?? 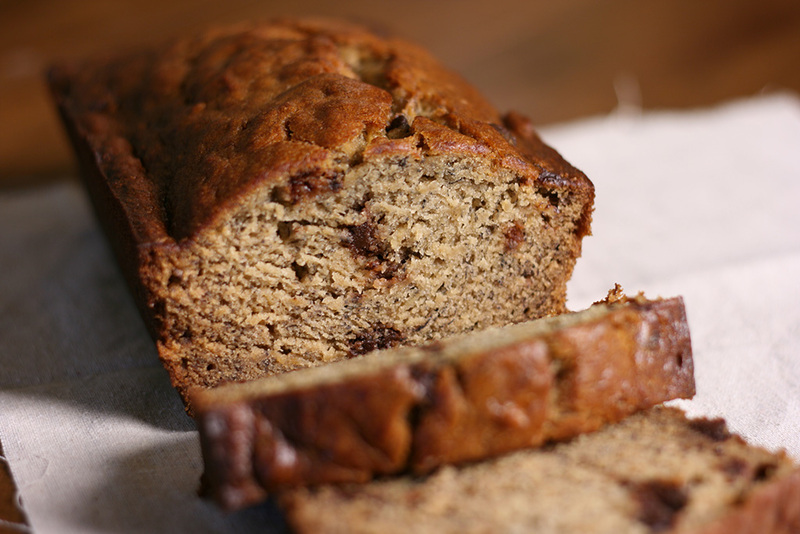 You totally could peel and freeze them for smoothies, but you should really make some banana bread. Preheat oven to 350°F and grease a 9 x 5 inch loaf pan. In a large bowl, cream together butter and brown sugar with a whisk. Add eggs and bananas. Mash bananas with the whisk then mix to combine. Combine flour, baking soda, and salt in a small bowl, then add to the banana mixture. Stir until just combined. Fold in the chocolate chips. Pour into the prepared loaf pan. Bake for 60-70 minutes, or until the top is browned and a toothpick inserted in the top comes out clean. Can’t wait to try it !!! Please let me know if you do try it! It really is my favorite banana bread recipe.